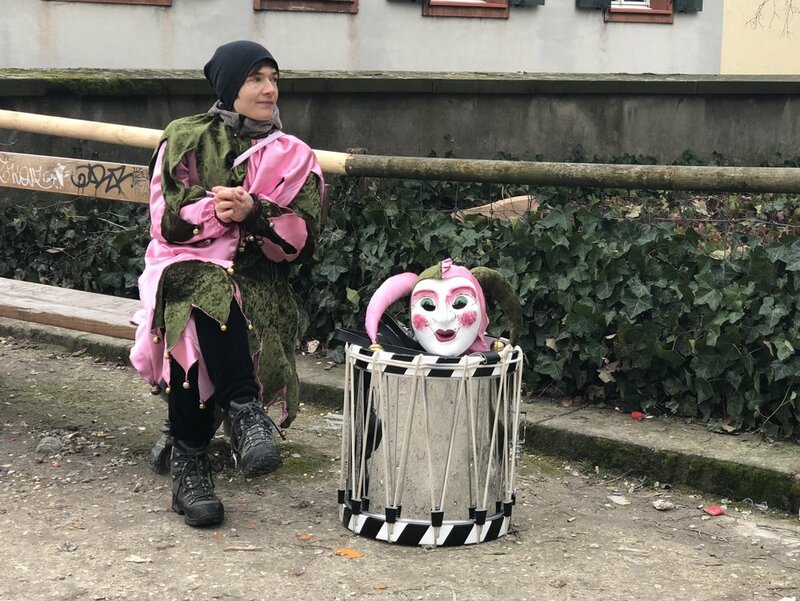 The Fasnacht Carnival of Basel, Switzerland, takes place annually between February and March and is the largest in the country. Three days of parades, costumes, floats and marching bands begin at 4:00 am with the lantern parade of Morgestraich. 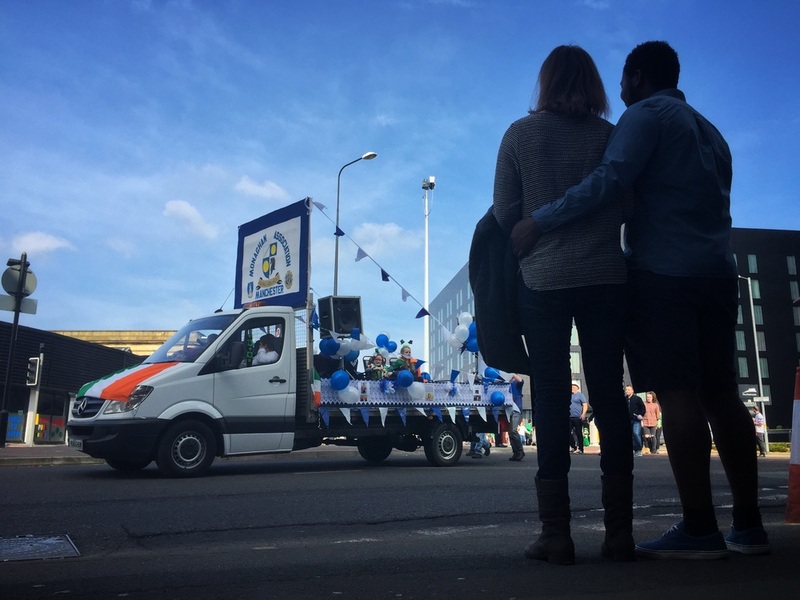 Satirical and political themes are displayed as a huge parade tours the darkened city streets. 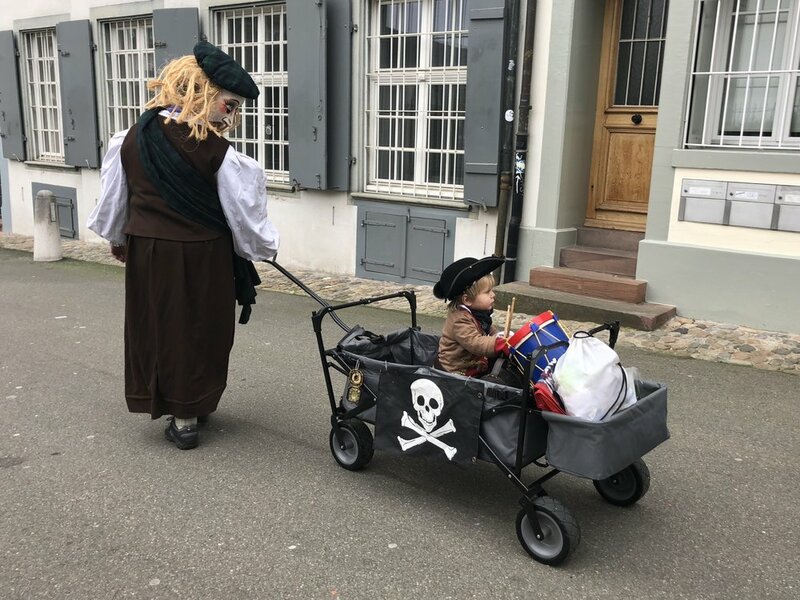 Approximately 18,000 participants dress up in a variety of costumes over the course of the festival and take to the streets. Whole families participate and the sound of pipers and drummers can be heard everywhere. Some believe that confetti was originally invented in Basel and spectators run the risk of being confetti-bombed during the course of events. Two weeks later and I am still picking out small strands of coloured paper from the recesses of my pockets! It’s a great fun event, a colourful winter spectacle, with some wonderful European street food on offer and perfect for photography. All images taken with an iPhone X.
Gwrych Castle stands proudly in the hills above the seaside market town of Abergele, North Wales. To motorists on the busy A55 main expressway below, this dramatic landmark may conjure up romantic images of medieval knights and fair maidens, the truth is that the castle was built in the 19th century as a private residence. 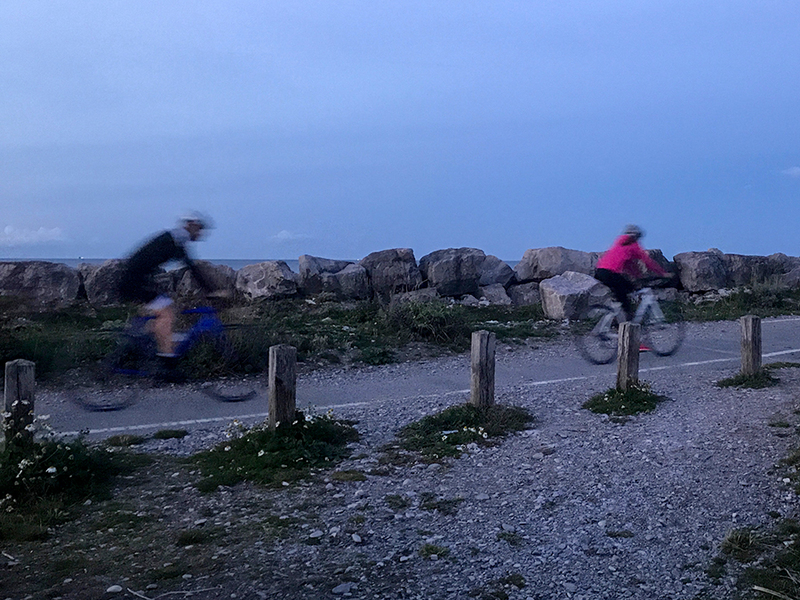 Wales boasts the world’s first continuous walking and cycling route along an entire national coastline. The North Wales coastal path stretches from Bangor to Prestatyn, around 60 miles in all. We have been exploring the section between Pensarn, close to where we live, and Rhos-on-Sea to the west. This section of the path is about 7 miles long and passes through Llanddulas and Colwyn Bay before entering the charming seaside resort of Rhos-on-Sea or Llandrillo as it is also known. The North Wales Coast Path. Our walk begins at Pensarn's small promenade where there is ample parking. The path runs next to the railway line at this point and is traffic-free except for cyclists (beware! ); several parts of the Wales Coast Path are designated sections of the National Cycle Network. There are good views of Gwrych Castle high in the wooded hills at Abergele as we leave the car park. Passing the Castle Cove Caravan Park we are reminded of just how densely populated the area is with caravans. The cafe on the park serves freshly cooked food at reasonable prices. There are great sea views all along this walk with an abundance of wildlife and fauna. Information boards are regularly positioned to explain the different species and history of the area. At around 2 miles we reach Llandullas. 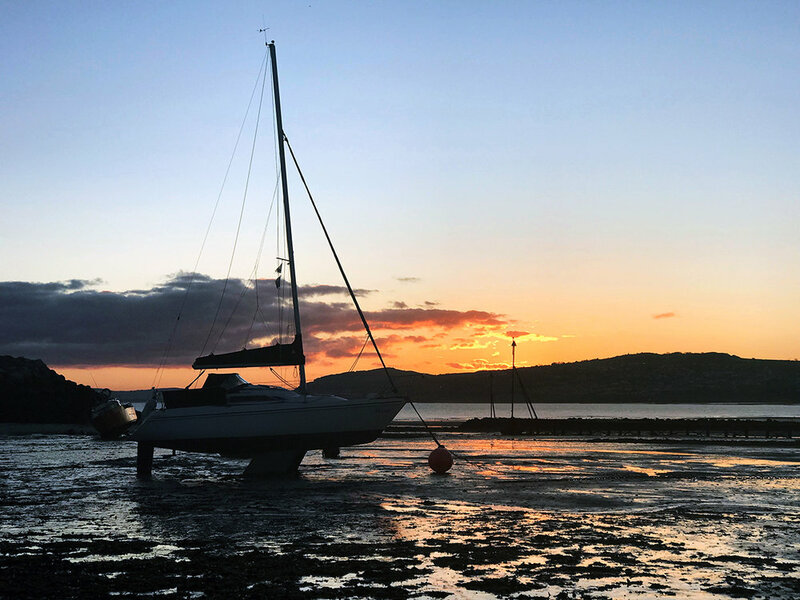 Close to where the River Dulas flows into the sea is Tides Cafe Bistro, located at The Beach Caravan Park, no shortage of refreshment stops on this route! Llanddulas Beach, similar to Pensarn, is mostly rocks and pebbles with the remains of wooden groynes, at low tide there is a beach. After following the route of the Dulas for a short distance, we pass a private house that until 1932 served as the Llanddulas life-boat station. The path now rises and presents a sharp incline as it traverses the Penmaen (meaning stone head) headland. As the pathway winds and lowers back to sea-level, the landscape is dominated by concrete sea defences known as 'dolos'. Each block weighing approximately 5 tons, some 22,000 structures were used in a major coastal protection project in the 1980s to protect the area and especially the adjacent A55 expressway road. There is a reminder of the intense quarrying of this area as we approach Raynes Jetty, constructed to transport limestone rock onto freighters via a conveyor belt system. In 2011 five lives were lost when the freighter MV Swanland sank in stormy weather after collecting 3,000 tons of cargo. Shortly after in 2012, the MV Carrier hit rocks adjacent to the jetty and was eventually dismantled on the spot. Another short incline brings us to a disused stone structure that was an ammunition store for the quarries. 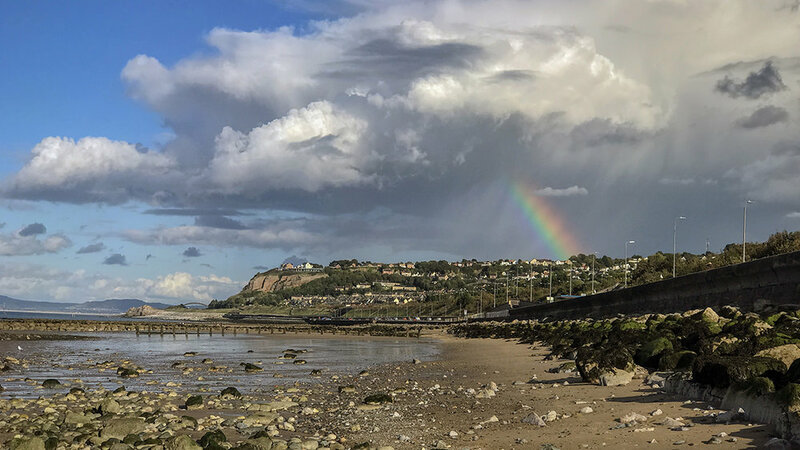 Our view from this elevated position is of Colwyn Bay's coastal sweep through to Rhos-On-Sea, a wide expanse of beach and the Little Orme headland in the distance. The path joins the promenade at Old Colwyn and leads us past Porth Eirias, part of The Colwyn Bay Waterfront Project. Opened in May 2013, this facility for water sports enthusiasts offers kayak and canoe hire in addition to lessons in sailing, windsurfing, paddle boarding and power boating. It is home also to a bistro designed and developed by Welsh Celebrity Chef Bryn Williams. 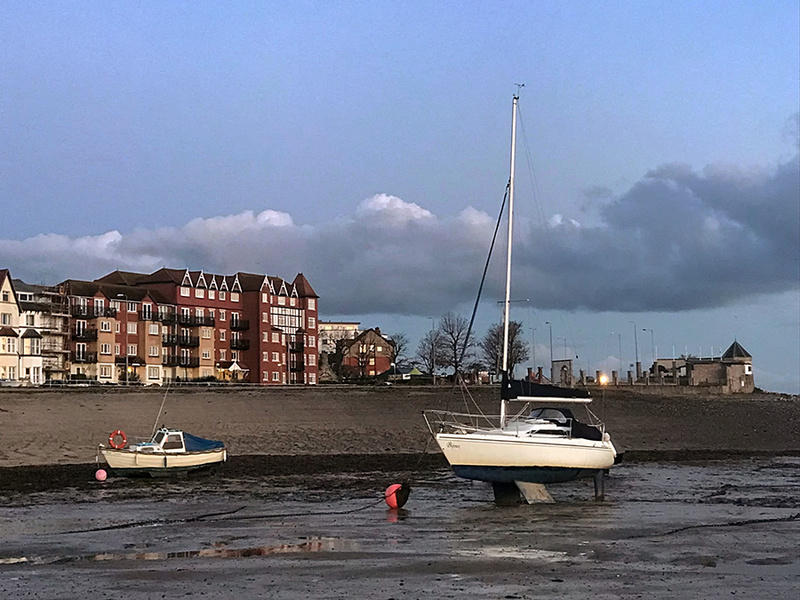 The initiative to redevelop and upgrade the sea defences here have provided an attractive waterfront; a key attraction for visitors and an important asset to the local community. Colwyn Bay with Penmaen Head in the distance. Sadly, standing out as a sore thumb in this otherwise modern and impressive environment is the now abandoned Colwyn Bay Pier. The Grade II-listed Victoria Pier closed in 2008 and its future was cast in doubt amid acrimonious ownership battles, failed restoration attempts and ultimate abandonment. A partial collapse of the pier in 2017 gave the local council the opportunity to receive permission for a full demolition which is scheduled for 2018. The beautiful new promenade stretches into the small village and seaside resort of Rhos-on-Sea. A small harbour, created by the formation of a rock breakwater that protects the village from flooding during high tides, presents a serene scene of moored boats and harbour jetty with the coastline stretching beyond. A wide variety of seabirds including oystercatchers, dunlins, red shanks, cormorants and many more can easily be spotted here. 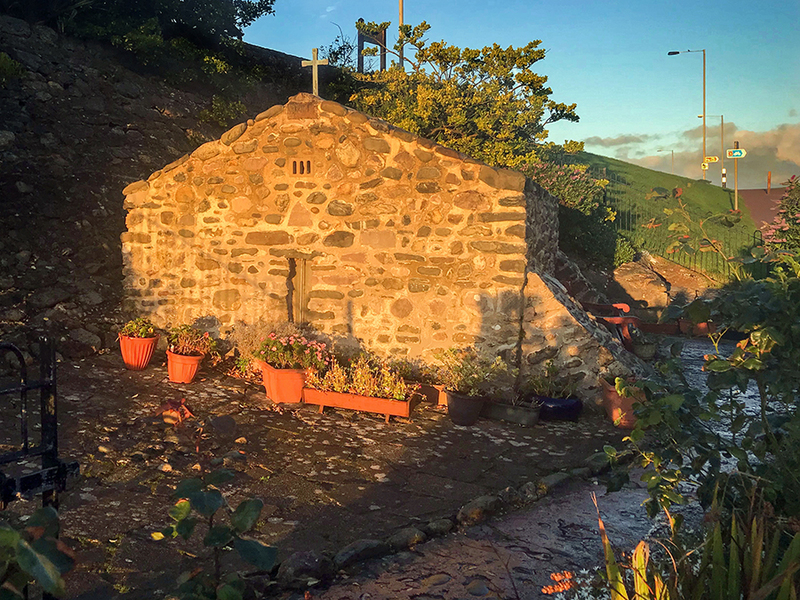 Our walk ends at Britain's smallest church, Saint Trillo's Chapel sits on the harbour path and is named after a 6th-century saint. Services are still held here and has seating for six. All photographs were captured on an iPhone 7 Plus. All images © Adrian McGarry 2017. 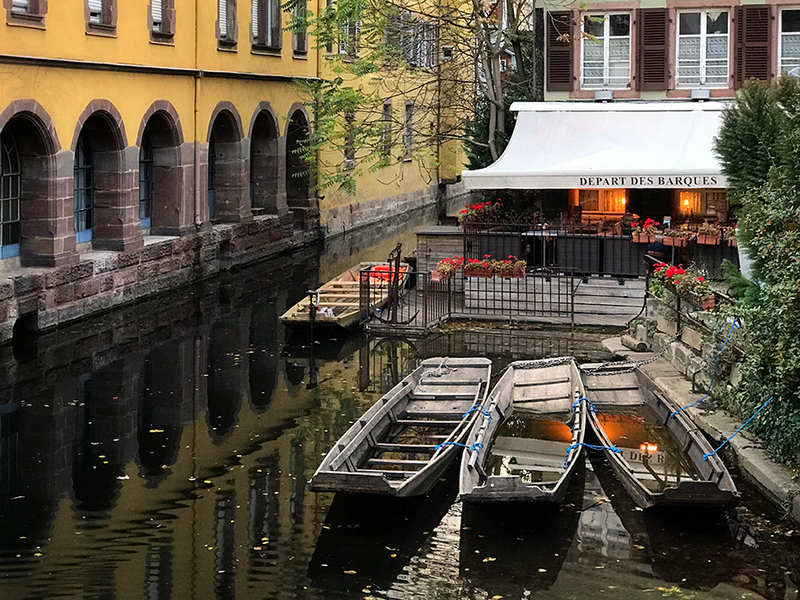 We had fallen in love with the charm and beauty of the Alsace region of northeastern France last year when making a couple of brief day trips with the family. Katrina and I promised each other that at some point we would take a road trip through the many towns and villages and explore more of the area. This year, as Autumn beckoned, we decided that it might be a good time to keep promises and make the trip. We weren't disappointed. We collected a hire car across the border in Basel, Switzerland and set off towards the town of Colmar. The journey is mostly motorway, well sign-posted and takes less than an hour. Colmar, half-timbered buildings in paint-box colours line cobblestone streets to the delight of tourists. Colmar, at the heart of Alsace, has an undeniable charm and is a top tourist destination. In the past we've day-tripped in summer and also at Christmas when the narrow cobbled streets and squares in the historical old town are turned into enchanting festive marketplaces. In contrast, visiting between these two popular tourist periods gave the town a more relaxed feel and we were able to admire the half-timbered houses, streets and canals without the high season bustle and queues. On a visit here you'll enjoy great Alsatian cuisine, lovely wine, and a proud culture. Our hotel, chosen because of it central location in the old town, gave us plenty of opportunity to step out onto the cobblestones and immediately begin strolling through the centuries-old town. This was to be our base for the next three nights whilst we explored the region during the day. Probably the most photographed view of Alsace is taken from the Rue de Turenne bridge in the 'Petite Venise' area. Gondola boats transporting tourists along the river Lauch glide silently below in this most picturesque area of the town. This is the Krutenau district, where market gardeners, fishmongers and tanners once transported their goods by boat. The old fishing cottages on Quai de la Poissonnerie (fisherman’s wharf) conjure up a delight of candy-coloured architecture that look as though the pages of a child's fairytale have come to life. Colmar is situated on the Alsace Wine Route (Route des Vins d'Alsace), considering itself to be the capital of Alsatian wine (capitale des vins d'Alsace). 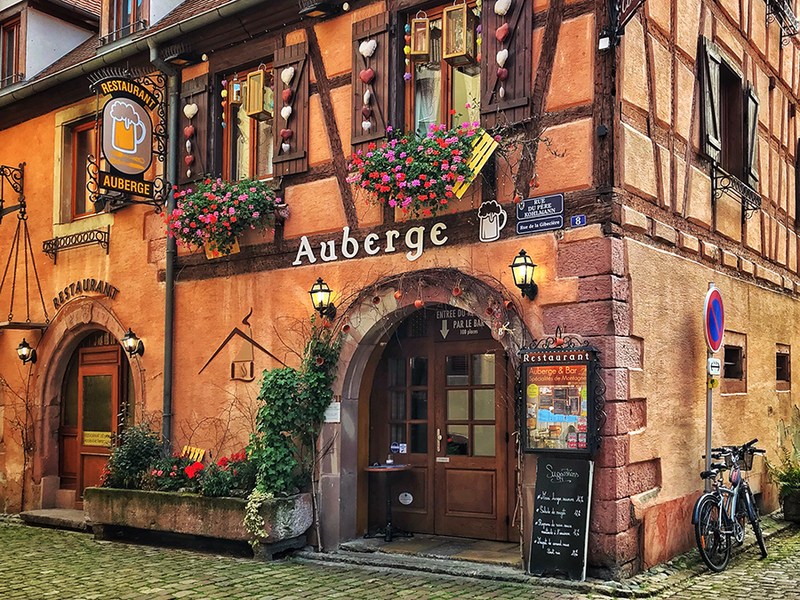 The 170 kilometre wine route is one of the most popular ways to explore the traditional villages of the Alsace region whilst learning more about the region's world-famous wines. We drove out of the town next morning and followed the wine route North for around 15 kilometres. Riquewihr, a romantic, medieval gem. Our drive took us through gently rolling countryside, lined with beautiful golden coloured vines, aglow in the late autumn sunshine. 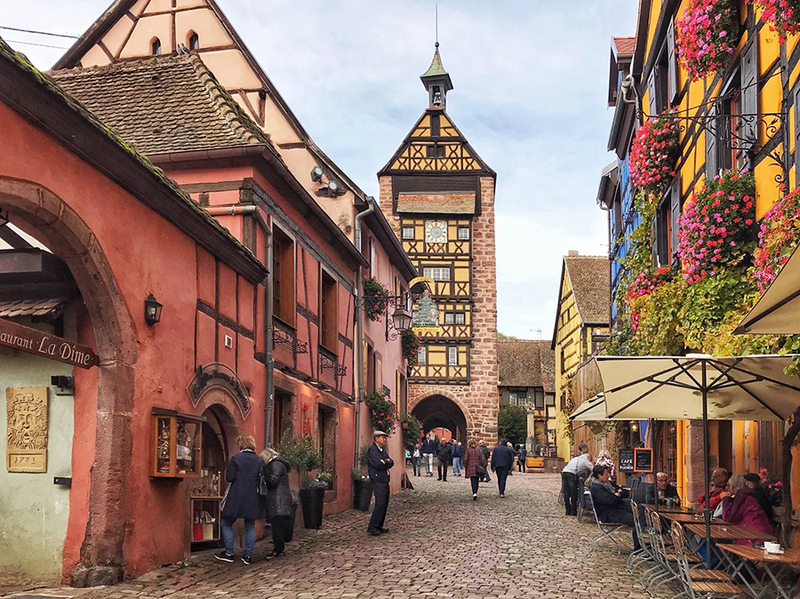 We didn't know much about Riquewihr prior to this visit, so we were immediately stunned by the beauty, colour and character of this romantic, medieval gem. Behind its 13th century fortified walls there is an authentic charm with brightly painted buildings, timbered walls, arched doorways, window boxes bursting with colour and a maze of narrow alleys. The insanely picturesque Rue du Général de Gaulle is the pedestrian-only main street with numerous souvenir shops, patisseries, wine merchants, cafés and restaurants spilling onto the cobbles. At the top of the street is the Dolder Tower, dating back to 1291, the Dolder was an integral part of the town's walls serving as a watchtower and gated access. 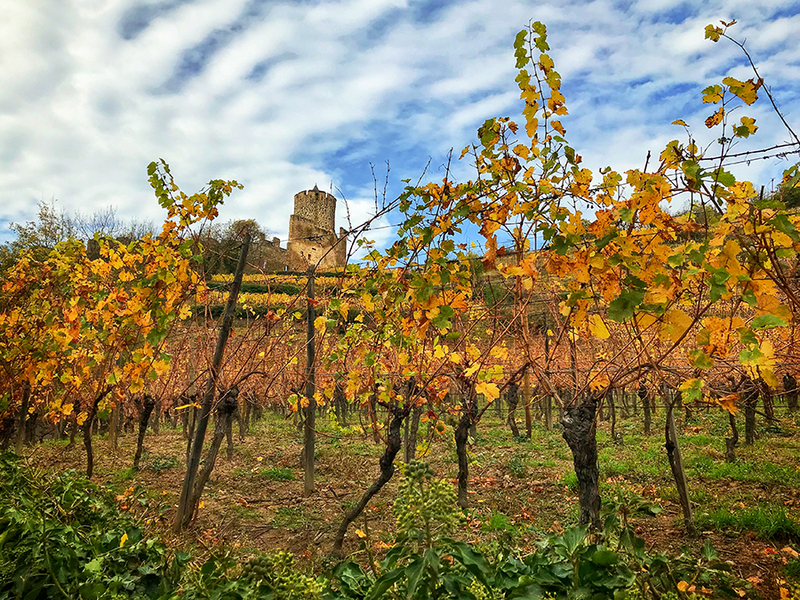 We had expected to stay in Riquewihr for around an hour, some three hours later we reluctantly left and headed for our next destination. Ribeauvillé is a charming town which has successfully retained its heritage. We only had to travel around 5 kilometres for an afternoon visit to Ribeauville. 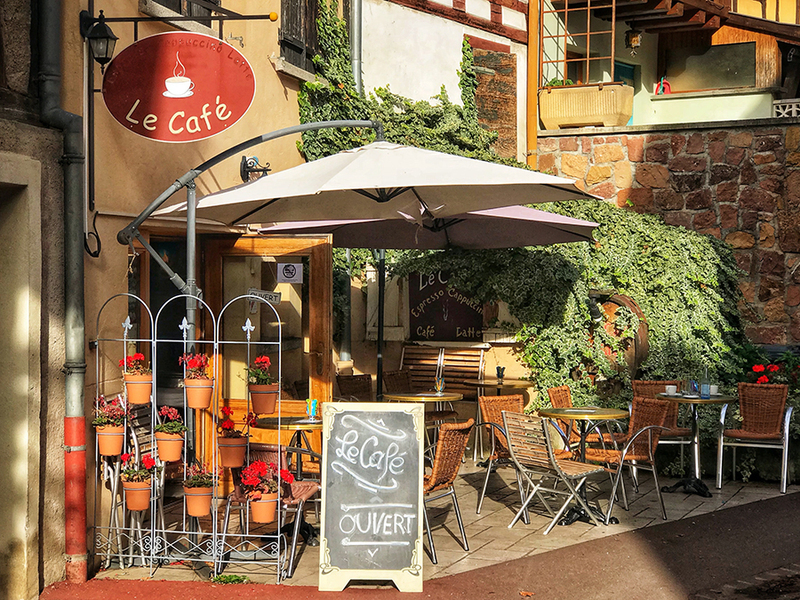 Framed by vineyards and rolling hills extending to the foot of the Vosges, the town is overlooked by three ruined castles and once again we found ourselves strolling through streets straight from of a storybook. 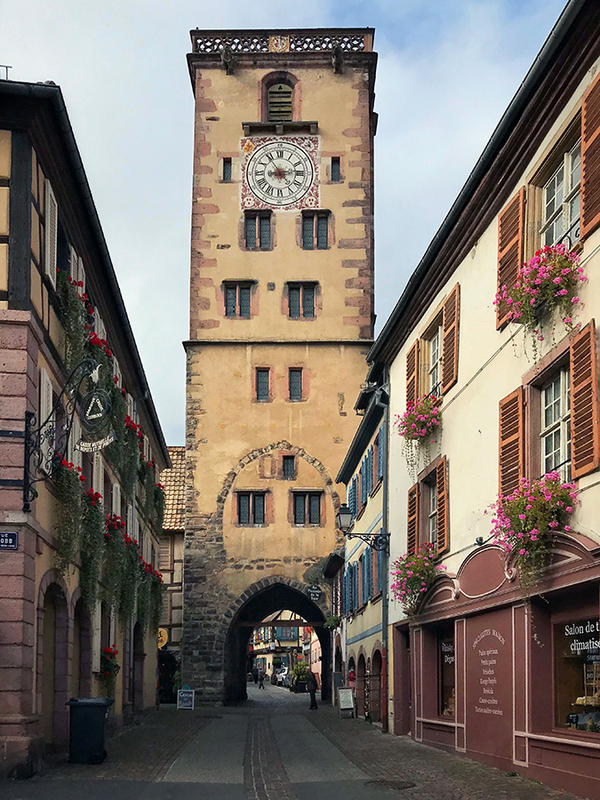 The narrow main street, crowded with eateries, pottery shops, bakeries and wine sellers is bisected by the beautiful Tour des Bouchers, or Butcher’s Tower, a medieval clock tower and gateway. Enjoying a well earned beer, we rested our now aching feet and sat outside a typical winstub allowing the afternoon sunshine wash over over us. A winstub, if you didn't know, is a traditional tavern of northeastern France. A typical Alsatian Winstub (means literally “wine room”) will usually have a cozy interior, panelled walls, heavy wooden chairs, traditional red checked tablecloths and curtains. This is where you will find Flammkuchen or Tarte Flambée offered, a thin layer of bread dough covered with crème fraîche, thinly sliced onions and lardons. The next morning we drove through early morning mist to reach the edge of the Vosges mountains. As the low-lying veil began to thin, we could clearly see our next destination. The Haut-Koenigsbourg castle dominates the skyline at an elevation of 757 metres (2500 ft). Constructed in the 12th century, the castle is built on mountain summit rock and was positioned to watch over important trade routes below. It was reduced to ruins by the Swedes during the Thirty Years' War and subsequently abandoned. 200 years of neglect followed. In 1899, after Alsace was reincorporated into Germany following the Franco-Prussian War, Kaiser Wilhelm II began a ten year restoration project. With spires, courtyards, spiral staircases, chandeliers, stained glass and canons, the castle has been beautifully restored. 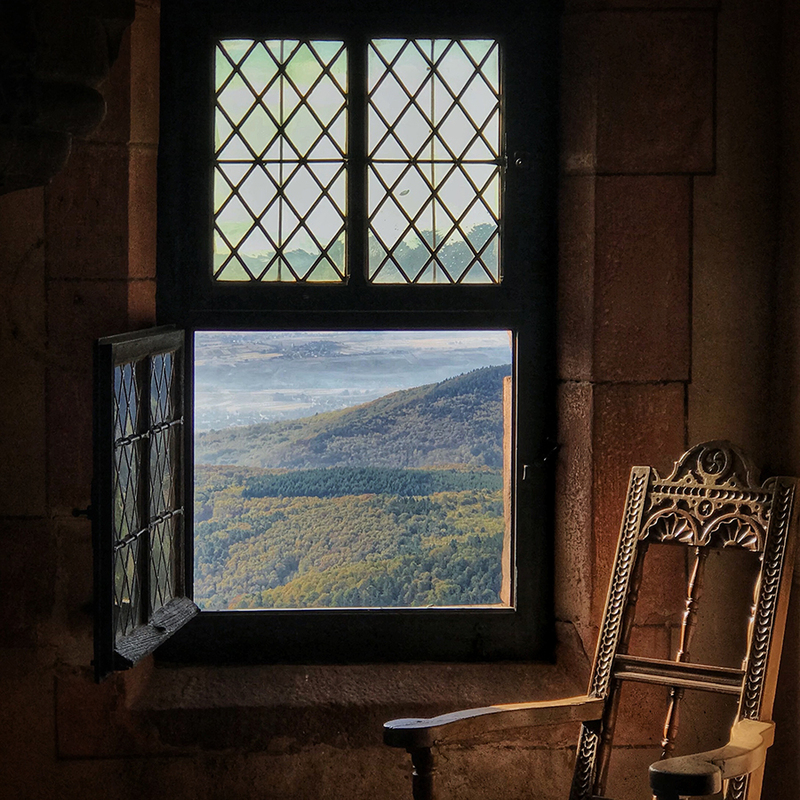 Following centuries of battles, fires, pillaging and abandonment, Haut-Koenigsbourg castle is a wonderfully restored monument of European history. 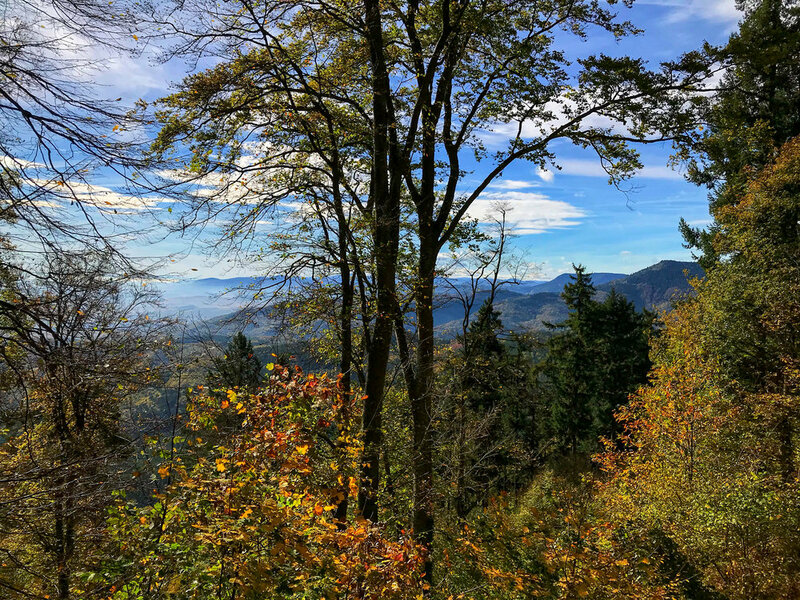 From the castle, there are stunning views spanning the surrounding Vosges Mountains, the Alsace plain, Germany’s Black Forest region and, on a clear day, as far as the Swiss Alps. 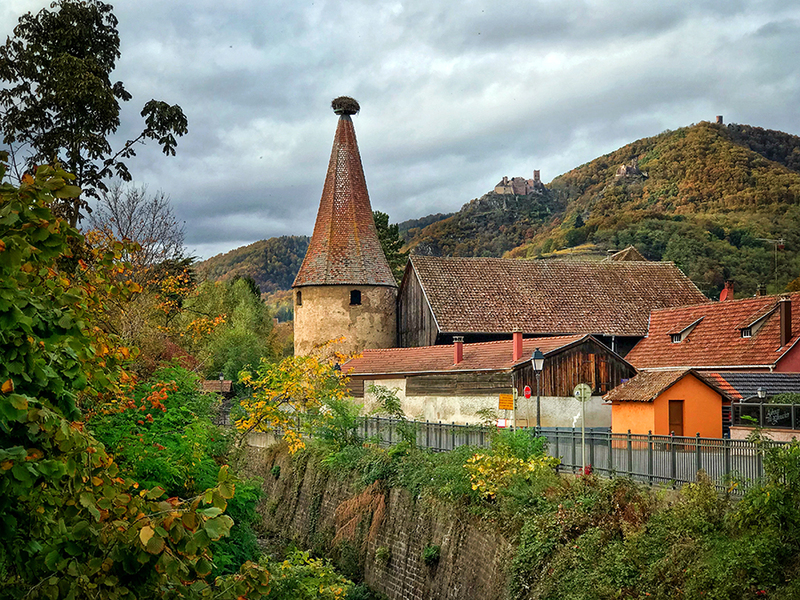 We drove back down the winding roads of the mountain and rejoined the Alsace Wine Route. We covered around 30 kilometres before reaching the town of Kaysersberg. Overlooked by the Chateau de Kaysersberg ruins, Kaysersberg is another picturesque village with a pedestrian only main street and, the now very familiar, brightly painted shops and houses. Recently voted on French TV as this year’s winner of France’s Favourite Village, Kayersberg translates to ‘Emperor’s Mountain’ a reminder of its strategic importance in this area's warring past. After exploring the main street and a maze of narrow streets we came to the point where the buildings straddle the River Weiss. This is probably the most photographed views of Kayersberg and can be seen on numerous tourist guidebooks and postcards. 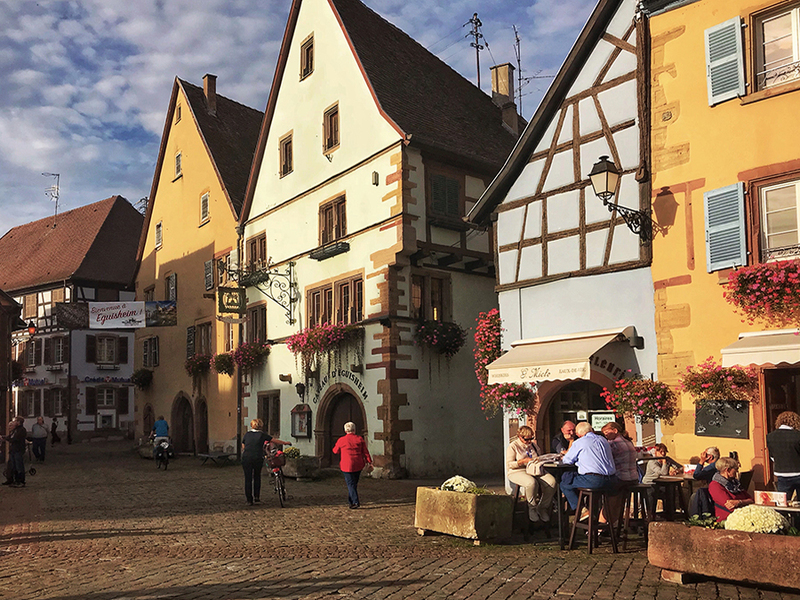 Eguisheim is yet another village that you just can't help but fall in love with, picturesque, accessible and friendly. We visited last year during the Christmas markets and instantly knew that we had to return. Walking through the narrow streets and ornate squares, we were able to appreciate even more the charm of this beautiful medieval village during a quiet autumnal afternoon. As soon as we parked our car we could see one of the prominent stork nests in the village on top of the Church of Saint-Peter and Saint-Paul. 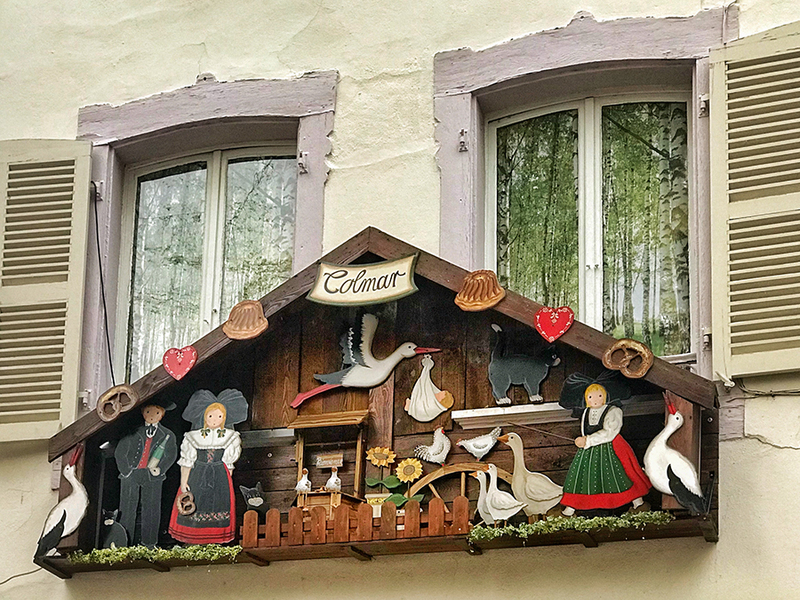 The stork is a constant feature in many Alsatian villages and towns folklore, having been part of Alsace culture for centuries. Symbols of happiness and good luck, legend says that if a stork flies above your house, then a baby is on the way. In the mid 1970s, the white stork was almost extinct in Alsace. Conservation programmes have encouraged the birds to return once again from their wintering grounds of Africa. A stork sanctuary on the edge of Eguisheim are hoping to breed and re-introduce storks to the region. As sun started to set over the sprires and towers, we began our journey back into Colmar for our final night. Next morning we bid Au Revoir to Colmar and began our drive back to Switzerland. There was to be one final stopping off point, more sombre and respectful than any of our previous destinations. Hartmannswillerkopf, known also as the Vieil Armand is a rocky peak in the Vosges mountains of Alsace. During the First World War, French and German troops fought a continuous, bloody battle to control he mountain. An estimated 30,000 French and German soldiers fell on the "Mountain of death", as it became known. A National Monument and Franco-German remembrance site is dedicated to those who lost their lives. The cemetery here has 1,264 graves of soldiers who could be identified. 12,000 unknown soldiers are buried in a memorial crypt. Above the Crypt stands the altar of the Homeland (l’autel de la Patrie), bearing the coats of arms of towns that contributed towards the monument. A preserved command post sits on the edge of the mountain. The battlefield, including well preserved trenches and shelters, can be accessed on foot. It was surreal to imagine the horrors that must have unfolded here as we walked through the forest, a carpet of freshly fallen leaves crunching beneath our feet. Looking at photographs taken at the time of the battles, the mountain was a desolate, ravaged landscape of tree stumps as far as one could see. Now, some hundred years later, nature has reclaimed the land. The new facilities and museum at Hartmannswillerkopf are impressive, the cemetery and crypt are beautiful, respectful memorials to futile hostilities and appalling loss of life. On our way back down the mountain, through the vineyards and eventually along the motorway, we didn't speak much. No doubt the experience at Hartmannswillerkopf had touched us but there was something more. After a four wonderful days, that had flown by too quickly, we didn't want to leave this amazing cultural and historical region, always a good sign when you're left wanting more after a holiday. 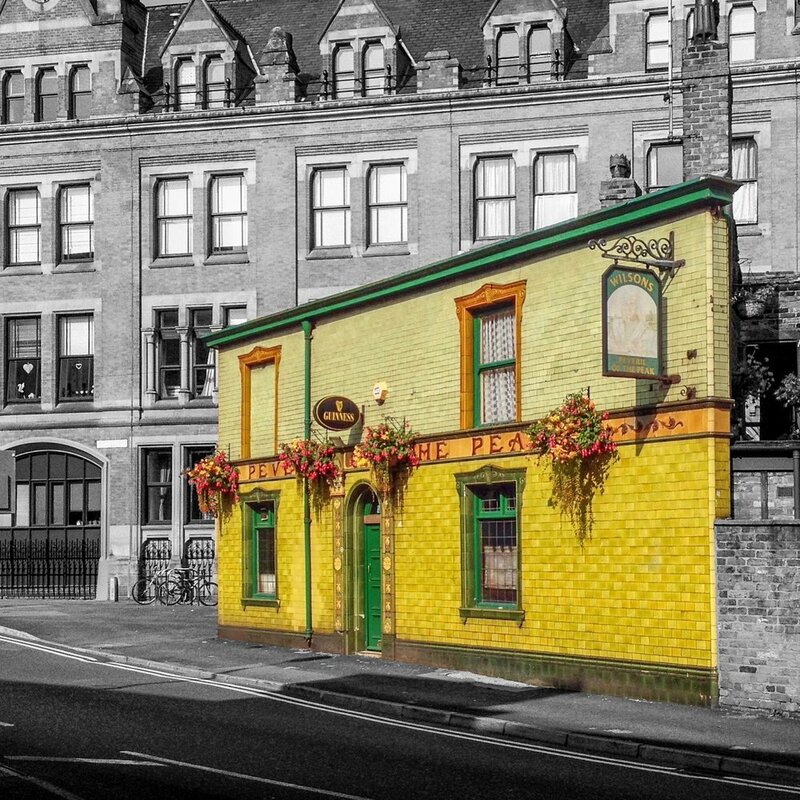 We'll miss the colours, hearty meals, wine, beer and the friendly welcoming atmosphere. There is a lot more to explore and experience in Alsace and already we are talking about a possible return next year. Lake Geneva is one of the largest lakes in Western Europe, its shores are shared between Switzerland and France hence its French name of Lac Léman. The city of Geneva, famous for watches, chocolates, banks and international institutions lies at the south-western end of the lake. We flew into Geneva to begin an autumn break that will take in Switzerland, France and Germany. A short paved jetty leads out to the fountain and you can get a close-up view along with quite a soaking! From here you get a real sense of the power of the water cascade. It is worth noting that the fountain is weather dependent; too much wind, freezing temperatures and maintenance will effect operating hours. We were fortunate that the autumn weather was still and warm and the jet ran from around 10am to after sunset. There is illumination of the Jet d'Eau at weekends. There are plenty of ways to see the city from the lake with hire boats, pleasure cruises and the public transport little yellow water taxis called Mouettes. Inquisitive swans with Jet d'eau in the background. A short walk into the old town, Vielle Ville in French, presents you with a labyrinth of small streets and picturesque squares filled with restaurants, cafés and shops housed in beautiful historic buildings. Again the photo opportunities here are numerous. For a different view of the lake, take the 160 step climb up the North Tower of St Pierre Cathedral. You will be rewarded with magnificent panoramic views and a better sense of the lake’s layout. Geneva's old town as seen from the lake at sunrise. Another favourite lakeside subject with photographers is the the Bains des Pâquis jetty with its elegant lighthouse. It’s surprising just how many locals plunge into the early morning waters here, braving the autumn temperatures well before dawn. The lighthouse offers great views of the lake and the Alps beyond. You'll find the lighthouse is equally rewarding to photograph either early morning or at sunset when the structure is fully illuminated. Following three very pleasant days in Geneva, we boarded one of CGN's boats for a cruise to Lausanne. CGN (Compagnie Générale de Navigation) is the largest boat operator on Lake Geneva connecting towns in both France and Switzerland. The decision to sail to Lausanne rather than catch the train was proven to be the right choice. We enjoyed warm weather during the 3.5 hours journey with views extending from pretty harbours and golden vineyards to medieval castles and chateaus. Notably Chillon, Morges, Rolle and Yvoire offered beautiful views and we have noted that a return visit is a must to explore these towns on foot. The snow-covered Alpine mountains were constant companions creating a dramatic backdrop. The medieval village of Yvoire on the French shore of Lake Geneva. Lausanne is the second-largest city on Lake Geneva and is the home of the International Olympic Committee. We stayed overnight, primarily to add our support for daughter Jenny who was running in the Lausanne annual marathon the next day. Unfortunately, mixed weather curtailed some photo opportunities but didn't dampen our spirits. Jenny ran a personal best in the marathon and as we left the city with Lake Geneva in the background I had the feeling that this wouldn't be the last time that we visited the area. Snow capped mountains line the shores of Lake Geneva at La Tour-de-Peliz near Lausanne. All photos taken on Apple iPhone 7 Plus © Adrian McGarry. What the HEIC is Apple’s New Image Format? Apple’s iOS 11 update changes the way we capture and store images on our iPhones and iPads. A new default image format HEIF (High Efficiency Image File Format, pronounced “heef”), created by the developers of the MPEG video format, is designed to save storage space whist maintaining photo quality. HEIC is the file format name Apple has chosen for the HEIF standard and files may appear as .HEIF in the metadata of an image. After 25 years of accepting JPEG as a common image format it is not surprising that an alternative has been developed to potentially surpass and replace it. HEIC makes it possible to store twice as many photos in the same space AND potentially have them look better. HEIC acts as a container for images and audio and Apple uses it to store still images encoded with the HVEC (H.265) video format. This adaptation lies at the heart of Live Photos as multiple images can be saved within container. Compatibility outside of iOS 11 is, at least for the time being, a consideration. Images convert to JPEG automatically when you need to transfer them to other platforms or social media sites. There are a number of converters on the market already for handling HEIF files on Windows. The HEIC format can be turned off in the iPhone or iPad settings. Up to now, I haven't had any major issues with the file format and I've opened them in numerous apps and transferred back and forward to my iMac and MacAir devices which are not yet upgraded to High Sierra. One word of caution is that Live Photos captures a high resolution still image and 1.5 seconds of movie before and after you take the shot. When choosing the new Long Exposure feature, the system cleverly stacks and blends the frames together and produces a great looking motion blur effect (tripod recommended). Whilst the image is more than acceptable for sharing on social media, closer inspection will show that the quality is less than the original still image. This is because the video, albeit high quality, is not at the same resolution of a still image. Furthermore some cropping will take place, in my example the image with the effect was approx 10% smaller. The overall quality was not as sharp or detailed as the original even though a tripod was used. Evening in Venice iPhone 6 Plus image by Adrian McGarry ©Adrian McGarry. It's the world's most popular camera, the one you always have with you, it's both powerful and liberating, oh and by the way the iPhone is capable of capturing awesome images. With increasing high-quality features, smartphones have evolved into serious image capture devices for both still images and movies. The iPhone has led the way in this photographic revolution since its launch in 2007. Recently Apple cofounder and iPhone visionary Steve Jobs has been posthumously inducted into the International Photography Hall of Fame for outstanding contribution to the artistic community and the industry around it, most notably due to the invention of the iPhone. 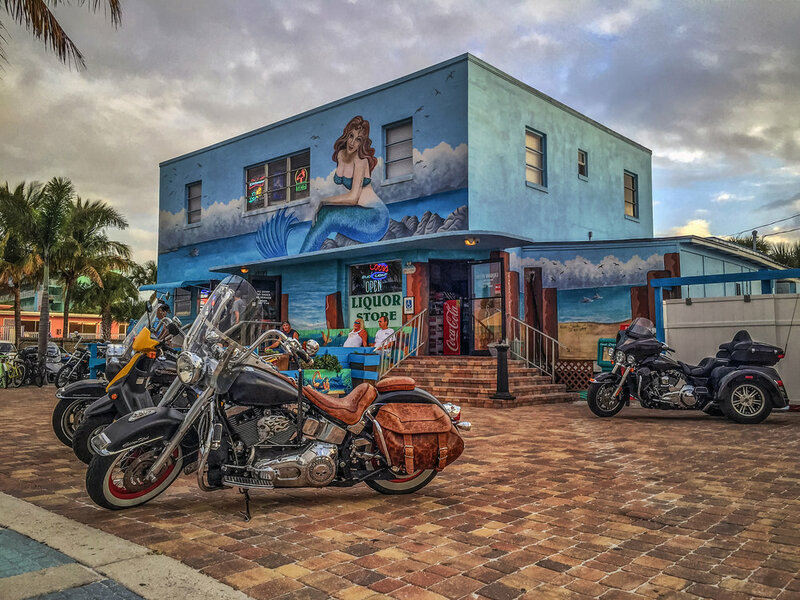 Mermaid Lounge by Adrian McGarry shot on iPhone ©Adrian McGarry. As smartphone camera technology advances, so too are the image editing apps that are becoming highly sophisticated; rich in features that achieve professional results rivalling the creative power of professional desktop packages. Combined, this equates to a staggering range of photographic firepower that unassumingly sits in our pockets. Add in the further capabilities to manage, make high quality movies, share, stream and collaborate, then not only is this device a one-stop camera and digital darkroom but is additionally supported by an extensive communications centre and highly efficient back office. Manchester Christmas Market by Adrian McGarry. ©Adrian McGarry. The convenience and connectivity of the device is the main reason that most casual photographers start to take photos on their smartphones. The majority of mobile photography are snapshots of daily life. A recent search on Instagram for the hashtag #cats returned over 35 million results. Uploading shots to social media is a quick and easy way to share selfies, life events and family moments. Users revel in getting positive comments and likes on their photos whilst interacting socially in global communities through their shots. 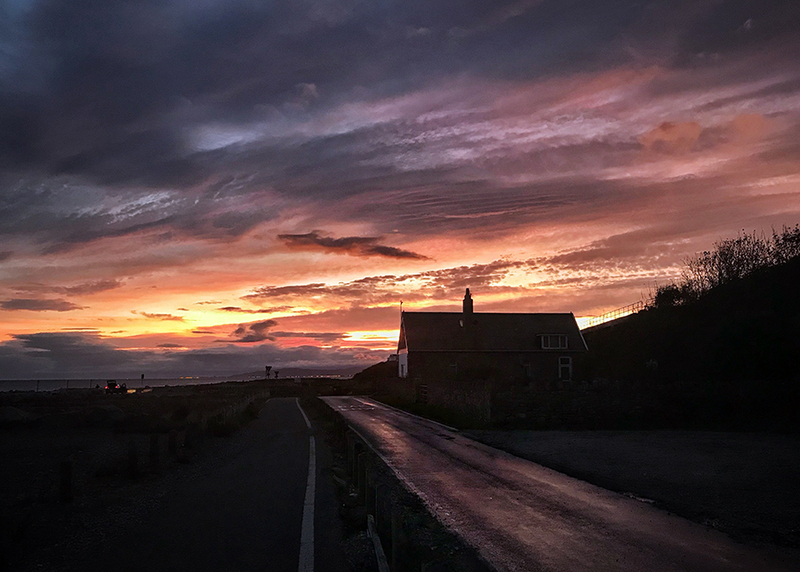 iPhone 6 Plus image by Adrian McGarry ©Adrian McGarry. At the start it was all too easy to miss the potential of creating serious work on mobile devices - the selfie ruled. As the sharing platforms have grown and matured, mobile photographers have found increased inspiration to explore, experiment and become more creative. The iPhone is a recognised art form with prestigious international photography contests such as the annual iPhone Photography Awards, now in its tenth year, showcases iPhone photography on a global stage. I've been shooting on an iPhone since 2012, within two years I was capturing more images on my iPhone than my Canon DSLR, to the point where today, the iPhone is my preferred camera device. I'm not making the case that an iPhone or similar device will create technically better images than a professional level camera, there are numerous situations that require high-end cameras to produce high-res photographs. I am convinced however that the iPhone creates images that have to be considered as serious alternatives in many other situations. After all, expensive gear does not necessarily make you a better photographer. iPhone panoramic of Beaumaris Pier by Adrian McGarry. ©Adrian McGarry. Apple are known to have a small army of engineers perfecting just the camera elements of the iPhone. Underscoring the tech giant's commitment towards improving mobile photography, the company are expanding on the 800 engineers who already work on iPhone camera-related technologies with a new dedicated research lab in France where a dedicated team of up to 30 researchers and engineers will work on improving image sensors for both the iPhone and the iPad. With a reported 200 pieces making up the iPhone camera and 24 billion operations to capture a single image, this technology is due to get better and further establish itself as the camera of choice for the masses. I strive to make technically competent images. Dyserth Waterfall by Adrian McGarry. ©Adrian McGarry. Personally, the iPhone has changed the way I approach creative photography. It has been extremely liberating to leave bulky DSLR equipment to one side and embrace the world of iPhoneography. I strive to push the technology as far as I can to generate technically competent images. In addition, I love to experiment and discover new techniques when creating artistic pieces. Within my iPhone, I have a whole world of possibilities at my fingertips; motivation, inspiration and satisfaction are constantly on offer and quite frankly, I can't get enough. My iPhone gallery can be viewed here. An estimated 75,000 people, warmed by early Spring sunshine, lined the streets of Manchester for the 26th annual St. Patrick's parade as part of the city's 21st Irish Festival. 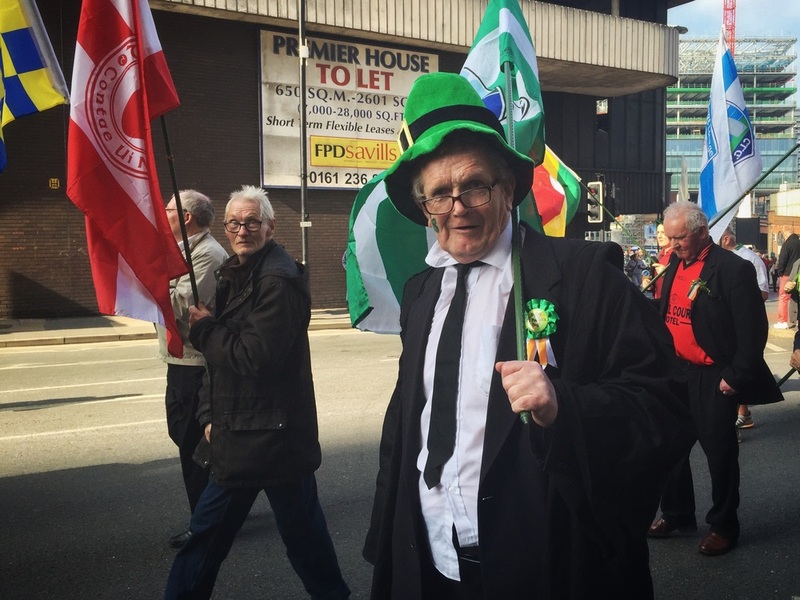 The two-mile route from the Irish World Heritage Centre in Cheetham Hill to Albert Square saw emerald clad community groups, animals and pipe bands take part in the celebratory procession. Too good an opportunity to miss for great street photography and a happy celebration in the afternoon sun. All images shot on iPhone 6 Plus. ©Adrian McGarry 2016. Over the course of the next few weeks Manchester plays host to its biggest event in the city's social calendar. The world-famous Manchester Christmas Markets featuring over 400 stalls spread across 10 dedicated sites have returned offering food, drink and gifts from all over Europe. A bird's eye view of the stalls in Albert Square. The market's origins began in 1999 with a solitary site in St Ann’s Square and have grown into what is now considered to be one of Europe's most popular Christmas attractions. Visitors come from across the UK and beyond, with a reported nine million enjoying the festivities in 2014. The heart of the markets is situated in Albert Square. Dozens of chalet-like stalls are erected in front of the town hall, presided over by a giant Santa, known by many as ‘Zippy’ due to his similarity to 80’s children's Rainbow show puppet. There is something for everyone at festive markets, not least photographers as the photo opportunities are extremely inviting. Colourful lights, decked-out stalls packed with Christmas products. Late afternoon is my preferred time to shoot to get the best from my iPhone. If I leave it too late then there is increased difficulties with lights being over exposed and shadow areas lacking definition. I prefer to shoot during the "magic hours" during and after sunset. The glow of the lights against a darkening sky can be very atmospheric. The space outside The Great Northern Warehouse complex has been transformed into a funfair and skating rink. I don't worry about capturing images that have people included, as I believe that this can add to the 'story' that I am recording. I avoid the busy weekends when the crowds jostle elbow-to-elbow and leave little chance for a pleasing composition. European traders sell food, drink and gifts. Manchester Council's website has all the information you need for a great visit.